I know I know, but I'm just SO tired! I have been meaning to blog and update y'all on how the events went down in the hospital but now the task seems so daunting! SO many funny things happened while we were in the hospital but for so long it killed me to laugh. I even started typing this last night but fell asleep at 9:30pm! After being in labor for a few hours I was completely dilated and ready to go but Evans had other plans. His head wasn't engaged and the docs told me that it would be near impossible to have him naturally. (I will try and some point down the road to go back and relive the whole process of how we ended up in the hospital but for now I'm sure people just care about seeing pictures.) I went in for a c-section and by 12:25pm Evans was here! I'm going to post a bunch of pictures from the birth just to let y'all see him!! I'm not going to lie, he is pretty much PERFECT. If there was ONE thing that was great about the c-section it was the fact that he wasn't mushed up and didn't have a deformed head!! I'm completely in love. And I think that is about all for now! I am about to upload more pictures from my camera so there will be more tomorrow (I HOPE!). I had an issue this morning and was back in the doctor's office. We are hoping that it turns out to be no big deal but for now I'm pretty much flat on my back and unable to do much of anything. Thank god for my parents being here and my husband turning into a father so naturally it was was scary. I have lots to share but it will have to wait until I am feeling a little bit better. I have so much to write and tell everyone. I also have no energy and feel like I've been hit with a mac truck. Evans arrived yesterday at 12:25pm via c-section much to my disappointment. I really didn't want to have to do that but it just had to happen as he was face up and his head was not "locked" into the birth canal. I dilated super fast (1.5cm to 10cm in just over an hour) but baby boy was not cooperating. C-section was totally scary and I definitely cried but in the end it was for the best. Evans is the most beautiful ever (I know I'm biased). Those section baby's just come out looking perfect. I'm a little annoyed that his face is all scratched up after last night but I have him in mitts now. I can't post pictures on blogger lite from my iPhone but I will as soon as I can. He was 8 pounds 4 ounces and 21.7 inches long. I have to stay in the hospital forever because of the section but I'll try and write as much as I can. I have some hilarious stories but since I'd rather die than laugh they will have to wait!! Well it finally happened! At about 1:30am this morning my water broke on one of my many trips to the bathroom. Deaner and I both showered and headed for the hospitals. Things were touch and go for awhile with contractions and I'm pretty sure I was almost the first fatality from killer contraction pain. Got the epidural around 6am. I've been fully dilated and ready to go for hours now but Evans' won't stop moving his head. So they cannot deliver him. He has another 1.5 hours or else they will make me have a C section. Say a prayer this doesn't happen. While I'm not opposed to the procedure, I really dot want to be in the hospital for 4-5 days. No thanks! I'm really nervous about it! I'll post soon!! Wish us luck!!! Another weekend down, no child has arrived. I am officially due on Wednesday and I don't think I need to express anymore how ready I am for Evans to make his appearance. 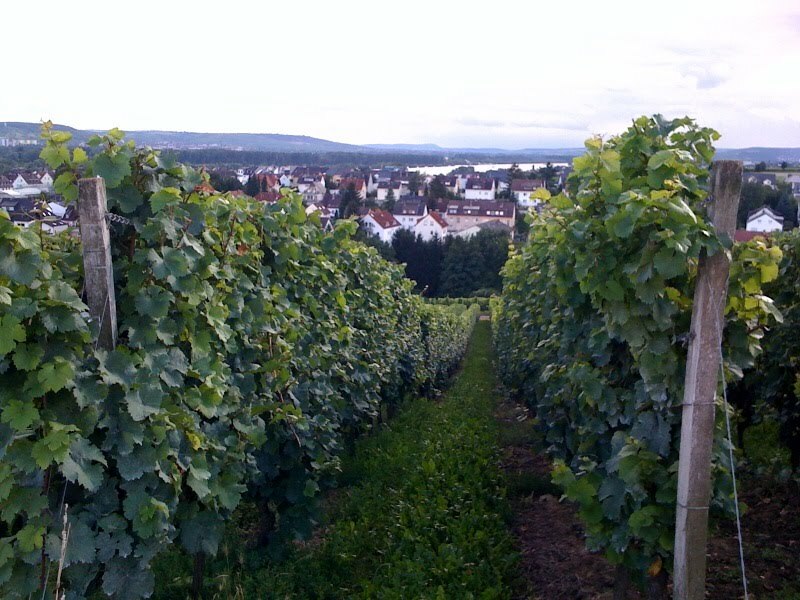 I am heading to the doctor tomorrow and I am really hoping that all the walking in the vineyards has helped move this along. It nothing else works I am going to put all my eggs into the basket of tomorrow being a full moon. Hey, whatever works right? This weekend was pretty relaxing and uneventful. Deaner and I went to Chili's in Ramstein AGAIN on Friday night. I'm sure we won't be able to go for awhile and it is nice to be out of the house for an extended period of time. 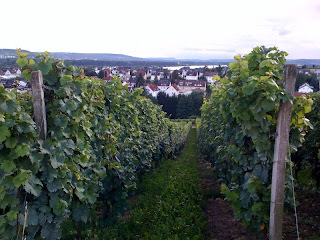 Saturday early afternoon we went to the Wiesbaden wine festival for lunch again as well. It was pretty much a Groundhog's weekend! Saturday night we ate Mexican (which does not compare to the States but we have found a restaurant that is acceptable here! )and Sunday we lounged around and took our last swim in the Deaner Country Club. Sadly enough, I felt as though it was time to take the club down yesterday or else I'm afraid it would sit out there and get all gross once the baby comes. It is all drained and sitting outside waiting to dry out (of course it is raining) before it gets put in the basement for the winter. I will really miss the pool but I am relieved that it is down and handled. I'll look forward to swimming in it next summer with my son! (who may or may not be here by then). Today I met Deaner for lunch at the base and then did a BIG shop at the commissary. I hate it when we run out of everything all at once because it makes our shopping A LOT more expensive. On the list today were essentials like toilet paper, paper towels, soap, water, deoderant, listerine, detergent etc etc. All the things seem to run out at once! Plus I had to pick up things for our guests that we don't typically buy like coffee and breakfast foods etc. I just want this baby to get here before they all arrive! So, keep me in your thoughts tomorrow and say a little prayer that it is day! I am really hoping so!! I'm going to start my new Giada de Laurentiis spicy macaroni casserole recipe for dinner and listen to the new David Gray double CD that I just downloaded on itunes. I'm super sad to be missing him playing in Atlanta tonight alas, 5,000 miles is a little far to fly for a concert the week you are due with a baby! Later! 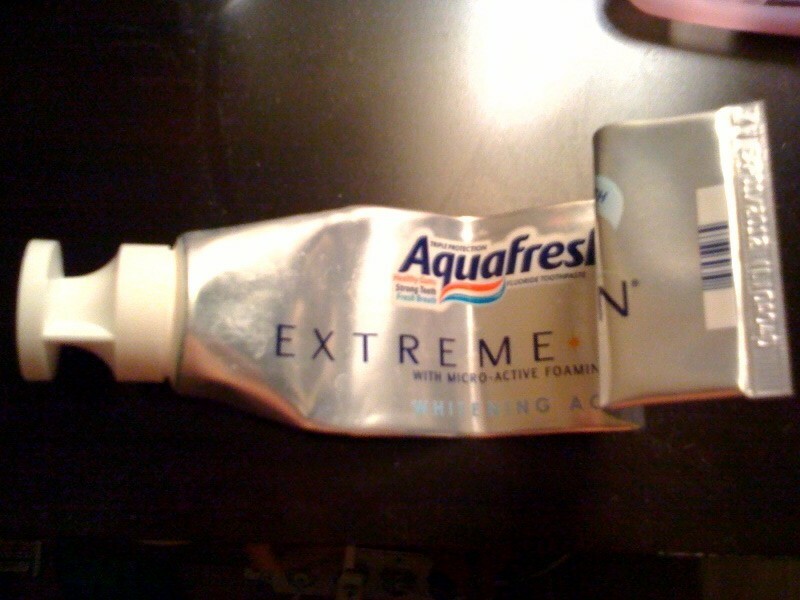 I need Evans to arrive before the end of this toothpaste tube is completely gone. You see, I bought a new toothpaste tube several weeks ago but packed it in my hospital bag, which is now gathering dust in the back of my car. I don't feel like rooting through it to get the new toothpaste out because I know I will never remember to replace it when it is time to go to the hospital. Nor do I really feel like purchasing another one. So the only solution is for the baby to hurry the hell up so that Mama doesn't have to worry about her dire toothpaste situation. AND I have to share what's left of this with Deaner! Happy weekend to everyone!!!!!! Happy Wednesday to everyone! 39 weeks today and counting! I couldn't feel LESS like I was about to have a baby if I tried! No pains, no cramps, no nothing today to indicate that a baby might be on the way! :) I'm posting so late tonight but the day sort of got away from me. I went and met Deaner for a really late lunch at the PX because he is in a conference all week long. When I got home I started some homemade spaghetti sauce to make lasangne for dinner. Deaner requested it and I figured I should make it completely from scratch if I was going to do it. I also decided to make two while I was at it and freeze one for after the baby comes. It turned out really well and I was happy with it. YUM!! However along the way I had to do something really ghetto. I made the second lasangne in the smallest pyrex I had but it still didn't fit into my gallon size ziplock bag that I was planning on sealing it in. So I had to improvise. I put one ziplock on one end and then a second one on the other end and sealed it with MAILING TAPE! I think it is ghetto fab and that it will work out just fine! Sometimes you have to use your brain! 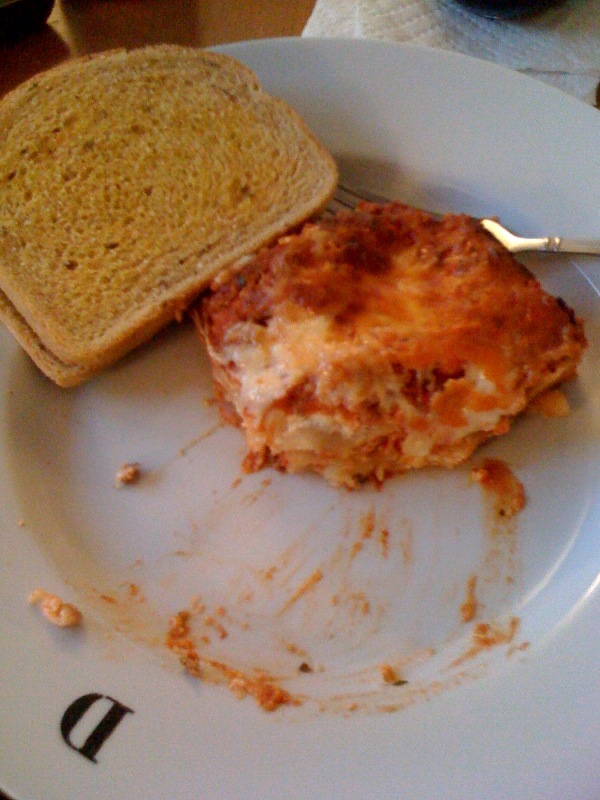 :) Dinner turned out delicious and I am nice and stuffed! Backing up a little bit and in reference to my post title today I have decided to do everything that I can to help get me a bit closer to giving birth. 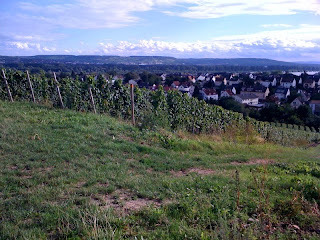 Today I made myself walk up in the vineyards for over an hour. I have to admit at the end I wasn't sure I was going to make it back but it was pretty nice and I am glad that I did it. 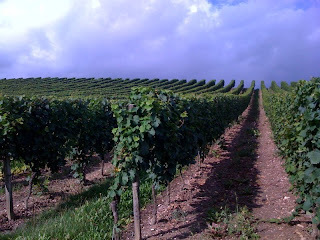 I snapped these shots because the vineyards are starting to look really pretty before harvest. 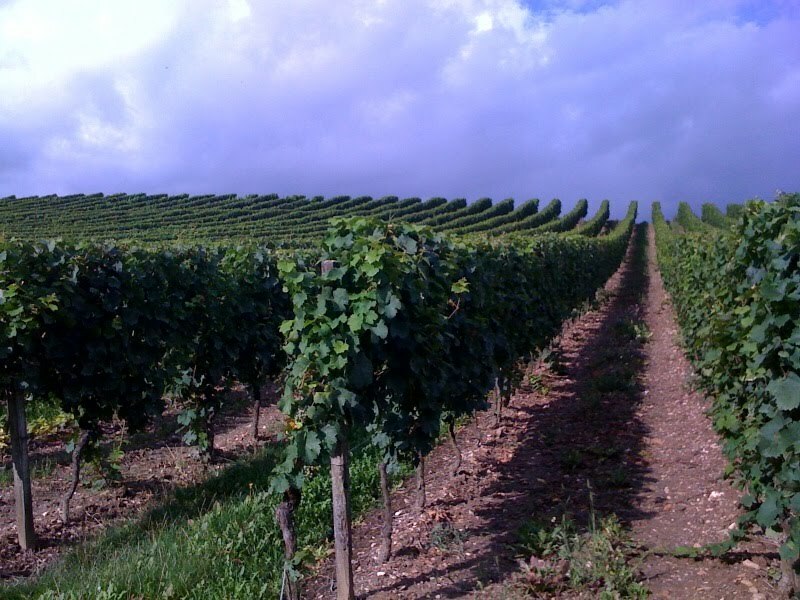 I am excited for all our parents to be able to see the vineyards while they look so gorgeous. At least Evans is coming at a pretty time of year. Unfortunately all I have to report is that my heels are killing me and I don't feel any closer to having a baby. I guess tomorrow I will just have to try a little bit harder! The weather is supposed to be nice for the rest of the week and weekend so maybe I can take advantage of it. I just hope it doesn't mean that it is going to get hot again. That is about all for today. I have to go clean up the kitchen now. Sometimes I wish I had a cleaning robot. After the appointment taking 20 years to establish NOTHING new Deaner didn't have time to have lunch. He went back to the office and I headed over to the base to check our mail since I have been expecting several packages. To make a very long story short, the mail guy refused to give me my packages at 1:30pm because he wasn't supposed to be open until 3pm. Seriously? You are standing right there and you can't just give this 10 month pregnant lady her freaking packages while she is standing in front of you? No go. I was so angry that I went and ate lunch alone and then sat in my car for 65 minutes waiting until 3pm. At which point I went to collect my mail and had the mail guy slam my packages on the ground before giving them to me. Needless to say, Deaner was furious and a complaint will be made about him. Then on my way out to the car, I snagged my jeans on a pole and ripped them. At least at this point things started to turn around! I received my book order from Barnes and Noble so thankfully I do not have to read What to Expect In The First Year ANYMORE in bed at night. I am over it. I can indulge in a new trashy series. My second package was from my friend Emory and contained Evans monogrammed burp cloths and a monogrammed outfit that I had given her to do. They all turned out fabulously!!! Now we are just waiting on a little boy to get here and put them to use! Then my last package was the best surprise ever!! It isn't every day I get presents in the mail that look like this! That contain all of these goodies!!! This package from my Aunt Dee and Uncle Butch really made my day! After a boring doctor's appointment, a rude mailman and ripped pants, getting all this really turned the day around!! This sleep sheep, stroller blanket and Bundle me bunting are all from my registry on Pottery Barn Kids and I'm so excited to have all of them. The bundle me is awesome because it fits into the baby's carseat or stroller for the winter and it a permanent blanket. Knowing the winters here we are going to be using it A LOT. I also got some pictures of Evans' nursery from Shutterfly so if I have nothing else to do tomorrow I can work some on his baby book. Things are definitely looking up as we head into the evening! I'm just waiting on Deaner to get home from the gym so I can start dinner. 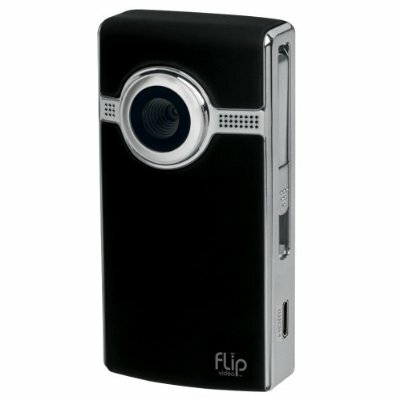 I'm going to ask for opinions again on the FLIP HD camcorder seen here. From comments I got yesterday it seems like everyone who has one really enjoys it and feels like it is worth having. My aunt disagreed but like I said, she never uses anything to it's fullest potential! :) My dad told me last night that they sell them at Costco now so I am going to have him keep his eye on them. It might be my next gadget purchase. Of course, if Evans never arrives, I'll never have anything to film! Happy Tuesday to everyone!! Seriously? Is it only Tuesday?? I should have posted about this in my first post of the day! I meant to but it completely slipped my mind. Don't forget to read my first post of the day! I have really been debating whether or not to get this Flip UltraHD High Definition Digital Camcorder. My aunt has one and I am not convinced that she uses it enough to make it worthwhile. However, she also never uses anything like she should and I think that I might really enjoy having this with Evans arrival swiftly approaching. I just think that maybe it would be nice to be able to send little clips of videos to our parents as Evans starts to get bigger. But I know we have Skype so I'm just not sure. The camcorder gets great reviews and I think that it can take/hold 120 minues of video before you have to put them on your computer for safe keeping. At $199 it is much less than a normal camcorder and it could travel with me in my purse. We were planning on getting an external hard drive anyways so that I can backup all our pictures etc so I could store them on there if it gets to be too much for the laptop. If anyone has one I would love to hear your opinions on it!!! Thanks! Happy Monday to everyone out there in blog world! I hope that everyone had a great weekend and are not depressed that we have arrived back at Monday again! 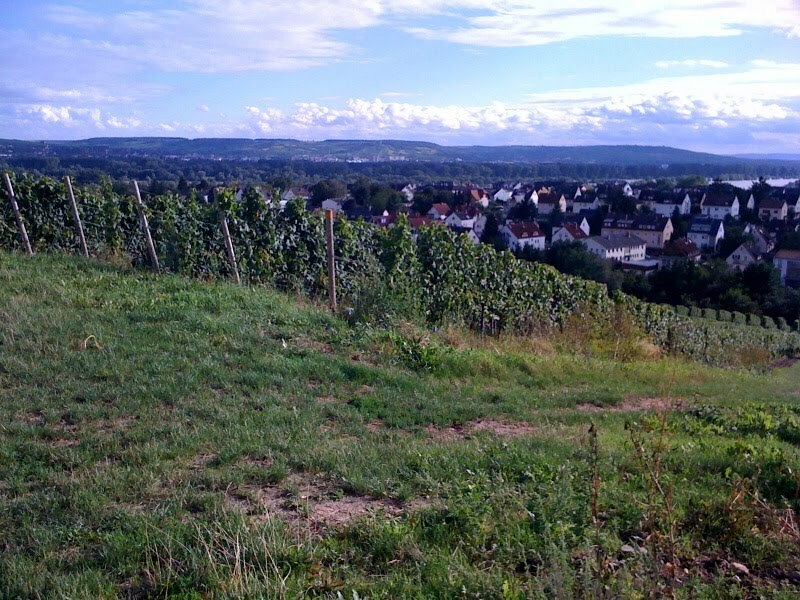 We had a great weekend here in Germany. No, there is no baby news to report but I just have a feeling that it is getting closer. I feel pretty funky but I'm hoping that is a good thing. I go to the doctor in the morning and I am hoping that she will tell me that I am much farther along than I was last week. Say a little prayer for me if you can! I don't know how much longer I can do this! Friday was a really great day! I have been getting REALLY bored with our normal weekend routine lately. I'm sick of eating in the same mediocre German restaurants and coming home early for bed since I can't really do anything fun (ie, have a DRINK). I met Deaner for lunch on Friday afternoon and we ate at a great Chinese restuarant that we both really liked. It is always nice to find a new restaurant that we (I) find acceptable. After lunch I came home and did a bit of internet shopping for Evans. I know I know, I am going to stop but really, I couldn't once I found these. 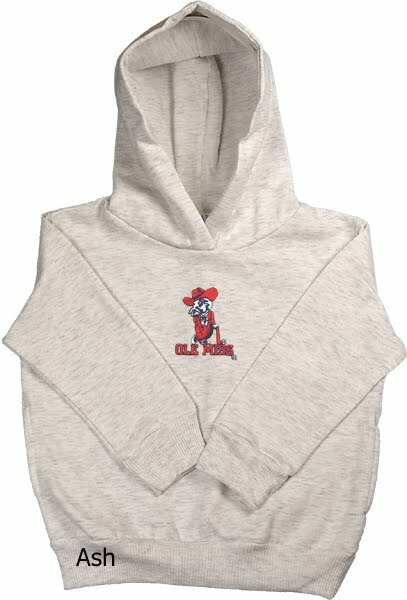 Game Day Baby Gear is a GREAT site that I stumbled across when searching for Colonel Reb items (which come off the shelves at the end of the month!). I thought that these overalls would be super cute for Evans next football season and he will be so vintage with his Colonel Reb Gear. And the price was extremely reasonable. These overalls come in most all schools as well so check out the site. I also couldn't resist picking this up since it won't be available after August! After my purchases I felt obligated to try and find something for Evans in UVA but they didn't have the overalls. 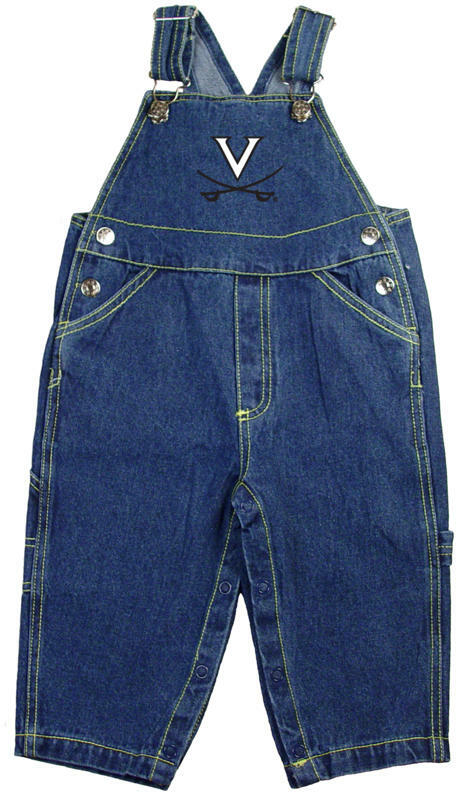 The thing I love about smaller businesses like this is that I was able to email them and ask if it was possible to get the overalls with a UVA logo on them. About 30 minutes later I got this mock up and ordered them! Voila! Now Deaner can't say that I am biased! And I will not being buying anything else for football season for a long time! Friday evening Deaner and I decided to bite the bullet and drive over to Ramstein to enjoy some American food at Chili's. We hardly ever do this and it was really nice. Like I said earlier, I was really sick of eating at the same German restaurants and it was really nice to get out of the house and do something different. I mean, I know it was only Chili's but I thought it was great! Saturday we got up early and hit up the wine festival for lunch. It would have been a lot more fun with actual WINE but still. I snapped a few pictures because I just think that the festival is so much fun. Next year I plan on enjoying the festival to the fullest! I did get to eat some delicious Flammkuchen and Deaner got to eat his favorite sausages. Saturday night we got to enjoy our favorite Greek restaurant with Steph and Jon and it was a beautiful evening and very pleasant! Yesterday it was rainy and gross and we pretty much laid around all day after eating lunch and doing a bit of last minute shopping. Today is a bit crappy too. I met Deaner for lunch at the PX, went grocery shopping, started a giant pot of homemade lentil soup (since the high today is 62 and it is supposed to rain all day), emptied the dishwasher and now I have blogged. Whew! I think it might be time for a nap. I don't know why I am so sleepy but I really am. Maybe it is that whole pregnancy thing?? :) Hope that everyone is having a great Monday and that this week is more eventful than last! Come on Evans! We are almost there! I feel like all I do is count down to the weekends and then when the weekend is over I count down the days until I go to the doctor again! My life is turning into Ground Hog's Day! I've eaten lunch with Deaner everyday this week and then I head home to try and occupy my time!! Today I got Evans' Colonel Reb Jon-Jon's from The Divine Children's Show and I am thrilled with them. 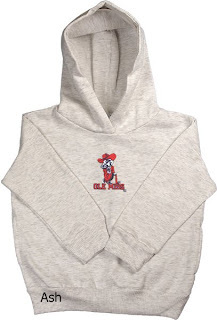 As most of you Rebel fans know, Colonel Reb is no longer going to be around so we are all desperately gathering up as much merchandise with him on it as we can! So, I had to have these as soon as I saw them! I mean, he is just so GREAT! I can't believe that I will no longer be able to buy things with him on it! Boo!! I'm hoping that Deaner will check the mail again on his way out from the office because the mail guy told me that I might have more packages coming! I sure hope so! So, we have no big plans for the weekend but that is okay. Maybe we will get lucky and come out on Monday with a baby! If I don't post tomorrow I hope that everyone has a great weekend! I'll post the roasted potato recipe underneath this post. They are SO easy and super delicious! Place cut up potatos into a zip lock bag. Shake bag up until potatos are coated. Before adding coated potatos to a pyrex pan, spray with pam and place pyrex in preheated oven (350 degrees) to heat up pam. Maybe for 5-10 minutes. This will prevent potatos from sticking. Pour potatos into pyrex and put back in the oven. Bake for 35-45 minutes or until crispy. Let stand for 5 minutes before serving. Delicious! I love how I didn't post for one day and everyone thought that I had the baby! No such luck! I don't think this baby is ever coming, just for the record. I bet that I have two more weeks or so. I wish that my doctor NEVER mentioned to me that she thought I might be early. We might have to have a chat about that if I decide to ever have another child while living here in Germany. It is really cruel to play tricks like that. She should have told me that my due date was sometime in mid-September and then I'd be surprised to have an early baby! Anyways, I have posted a picture of a sign that I keep coming across in Germany. There are lots of pretty funny road signs here but this one is one of my favorites. It is posted on school buses and at crosswalks where school buses stop so I am assuming that it is the German equivalent to this American sign. I just get such a kick out of the German sign because it really reminds me of an angry sister dragging her brother along behind her! At least in the American sign it appears that the people are being polite to each other (even though it does look like they are both carrying purses though one is obviously a man?). The lady in the German sign is a no nonsense kinda person and I am glad that I am not the child she is dragging along with her! Ha ha! In other news............our house smells like we are currently hosting a circus inside of it. We cannot figure it out but our best guess is that the vineyards were fertilized with some sort of manure sometime in the past few days and it is causing our house to REEK. It is too warm to close up the windows so we are suffering through it and know now what it would be like to have pet donkey's living inside our house with us. I think we will pass! I had lunch with Deaner this afternoon and then headed over to our cell phone store to see about adding unlimited calling to the States on one of our cell phones for the next month or so. Fortunately it can be done for only 25 euro a month but unfortunately you have to add it for a minimum of 3 months. I'm just not sure it is worth it. While I know I really am going to want to talk to my mom while I am in the hospital and I know that Deaner is going to want to call his parents with news and updates etc, I just don't know if it is worth it. We have unlimited free calling to the States on our home phone and the reasonable part of me says that we should just email from the hospital and call when it is convienant for us at home. I'm torn. Of course if Evans doesn't pick up the pace, there is a solid chance that my parents will actually be here for his birth since they arrive on the 28th. Got to talk to Deaner about that one. Now I think I will go do some vacuuming and probably suffer from heat exhaustion. I think I have an obsessive fear that I am going to go into labor and my house is going to be messy and I won't have time to clean it. I know people keep telling me to enjoy this time while I can but folks, I'm bored. Please don't respond and say that this is the last time I will ever be bored, because I sort of get that. I just hate sitting around and doing nothing! Off to find a project! After 25 looooooong torturous days I finally saw my doctor this morning. I was really hoping (in vain) that she would send me directly to the hospital to give birth! Wishful thinking on my part even though I didn't really think this would happen. Anyways, all with Mr. Evans looks great and he is weighing in at around 7.5 pounds now. I'm also already 1cm dilated which my doctor seemed to think was great at 37w5d especially since this was my first baby. She laughed when I wasn't more excited because I told her I was hoping to be much more than that! She said that it wasn't outside the rehlm of possibility that it could take another week or two for Evans to come. I'm okay with a week longer but two weeks I might be a little bit annoyed! Pray for some more progression this week! My next appointment is a week from tomorrow! I went to the grocery store on my way home and did the shopping for the week. I really didn't think we needed anything much but still managed to spend $75. Now I'm home and chilling on the couch. I actually asked Deaner if he wanted to come home and go walking with me in the vineyards instead of him going to the gym and he totally turned me down! Fine with me! I probably wouldn't have wanted to go anyways by the time he got home! Ha! Anyways, hope I can find ways to fill up my week with things to do to keep me occupied! 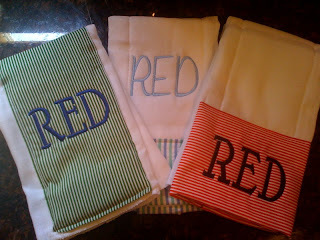 I wish I had just one more project!! Any ideas?? Does anyone else feel like this week has been draaaaaaging along at the pace of a snail? I sure do. Maybe it is because I FINALLY have a doctor's appointment on Monday after THREE LONG weeks of waiting in anticipation to find out if something is going on down there! It's just my luck that my doctor's office closed for weeks 34, 35, 36 and most of 37 of my pregnancy. That is something that would NEVER happen in the States but is quite common here in Germany. I got a pat on the knee and was told to keep swimming in my Country Club by my doctor while in the States I could have seen any number of partner's in the practice during these last few weeks. My only hope is that when I go on Monday my doctor will tell me just how much I have progressed in the last three weeks and then it will make the wait worth it! Fingers crossed! Today has been a semi productive day. At least I didn't sit around the house all day. It is already 4:45 and I JUST sat down at my computer for the first time all day. I went and met Deaner for lunch this afternoon because both of us were feeling a bit anxious over the imminent arrival of our baby. The whole not knowing thing really puts me on edge. Deaner admitted this morning that he couldn't even sleep last night because he is feeling so anxious. I think we will both feel better once we see the doc on Monday. After lunch I ran by Steph's house to borrow book #4 in the Harper Connelly series by Charlaine Harris. Harris is the author of the popular Sookie Stackhouse series, which the HBO show True Blood is based on, and since I am done with the Stackhouse series it was time to try another one. I am really enjoying the Connelly series! They are not about vampires and while I know that they hold no literary value whatsoever, they are quite enjoyable and I am almost on the last book already. I really hate series that only have 4 books in them! Guess I'll just have to wait for more. Fortunately for me, Harris writes two other series (Lily Bard and Aurora Teagarten) that I am interested in reading but I just have to wait until I can justify buying them all at once off Barnes and Noble. These books are quick reads and highly entertaining. I would recommend them to anyone seeking mindless beach reads! Now I'm on the couch and about to start reading again. The veggies and meat are chopped for our stir fry dinner and in the fridge. I have about an hour to chill before Deaner gets home from the gym and I'm ready to relax! I hope that everyone is having a great Thursday and that next week goes by a little faster!!! 37 weeks and ready to pop! 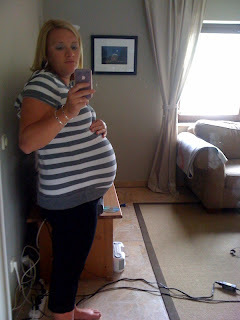 Well maybe not exactly ready to pop but I do feel like I am. I am getting really tired of hearing my hips pop and think that pretty soon it might just make me physically sick if it doesn't stop! Today I was sitting at my kitchen table minding my own business when my Germany neighbor stopped by. When I stood up to open the window to speak to her she exclaimed "Are you sure you aren't having twins"?? Ha ha ha. Very funny. Seriously, do I look that big? I didn't think so but maybe I am wrong. I'm really annoyed that those wires are all over the floor in my belly shot but not annoyed enough to move them and retake the picture! Anyways, today was not much more eventful than yesterday! I went and had lunch with Deaner today and then went to the commissary after assigning myself a project. Deaner works with someone who's daughter's birthday is this weekend and I decided to make her a little birthday present. 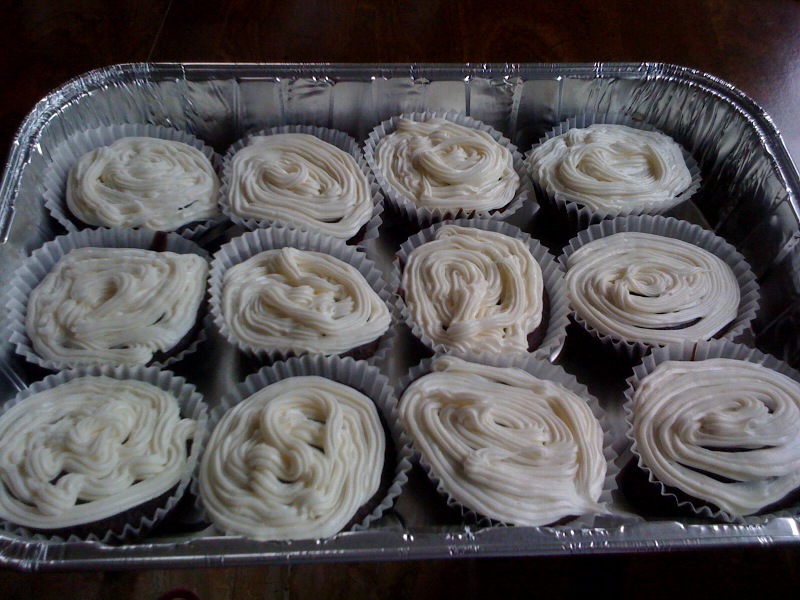 I'm not going to lie, I don't think I was a baker in my former life nor will I ever be good at it! 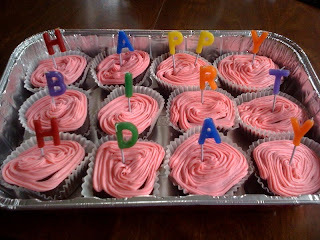 Here's how my cupcakes turned out! I hope she likes them. I'll have Deaner bring them with him to work tomorrow. Just ate a big dinner of spaghetti and it is time to veg out on the couch! Is it Friday yet? I know I keep saying how ready I am for Evans to arrive but today I am officially ready. Steph highlighted my hair so there is officially nothing left to do. I'd appreciate it if he didn't wait too long because I'd prefer not to have any roots in any of his homecoming pictures. I'm just sayin, I know this is about him and all but his Mom does play a pretty big role in it! The Crossfire made it to work this morning and Deaner is currently on his way home. Praying hard right now! It is raining outside and also sunny at the same time. That does not happen a lot here! The raining part maybe! Not much else to report today. I wish I had something better to share with y'all! We have having steaks for dinner and then I want to settle in with my book in my pjs! Talk to y'all tomorrow! I feel like it has been awhile since I have updated here. I hope that everyone had a really great weekend! We did although it got off to a rocky start. Friday I was stuck at home with no car again. Deaner decided it would be best for me to take a train into town for a late lunch and then I could have the car until it was time for Deaner to leave work. Well come Friday morning we realized that for some reason, unknown to us, there were no trains running into town! Just my luck! So Deaner convinced me to take a bus, against my better judgement! I went to the bus stop about 10 minutes early, bought a ticket and started waiting. And I waited. And I waited. When the bus was 20 minutes late I went to inquire if it was ever coming and actually understood the guy when he was telling me that I was standing at the WRONG BUS STOP!!! Grrrrrrr. At that point I was over it and came home. I spent a long boring afternoon by myself (Again!). We had dinner down at the river on Friday night since the weather was nice and it was nice and relaxing. Saturday we ran errands and then attended the First Annual White Trash Bash at Steph and Jon's house on Saturday night! It was a lot of fun and only would have been better if I could have actually partaken in some adult beverages! Everyone looked nice and trashy! I said that the only thing that would have made the party trashier is if I had actually gone into labor there! Here is Steph and me before the party started. Me and my baby daddy! I just love how that Dodge emblem is so pronounced by my belly!! There were several other girls there dressed up with pregnant bellies and at one point I was walking through the den and I heard someone say "that one really is pregnant"! Ha ha!! Hopefully not for much longer! We didn't get to stay too long at the party but I know that we both had a good time (especially Deaner)! Sunday we would have loved to have a lazy day but unfortunately we had things to do. The part for the Crossfire came from the U.S. last week and it was time for Deaner to prove his auto mechanic skills. We went to lunch and then headed to Deaner's office for him to work on it. While Deaner was busy I cleaned out my Jeep until it was sparkling. I vacuumed it out, washed it, armouralled the dash and doors, treated the leather and rain Xed all the windows! Now I am ready for a baby to come mess it up! I was exhausted afterwards. Surprisingly, the Crossfire made it home! It also made it to work this morning with Deaner driving it. We will see if it makes it to the gym and then home again. I don't want to be a skeptic but I don't want to jinx it either!! Today has been a typical Monday. I met Deaner for lunch and then I hit up the Commissary and stocked up just in case Evans decides to come anytime soon. I have changed our sheets, cleaned our room, and done all the laundry. Whew. I have also uncovered the Country Club, run the pump and put in chemicals. Having a pool is hard work! Especially when the weather has stunk lately and you can't even use it! Also my friend Emory at Emma's Closet sent me a picture of the burp clothes that she did for Evans. I am SO excited to get these!! Evans is going to be able to spit up in style! 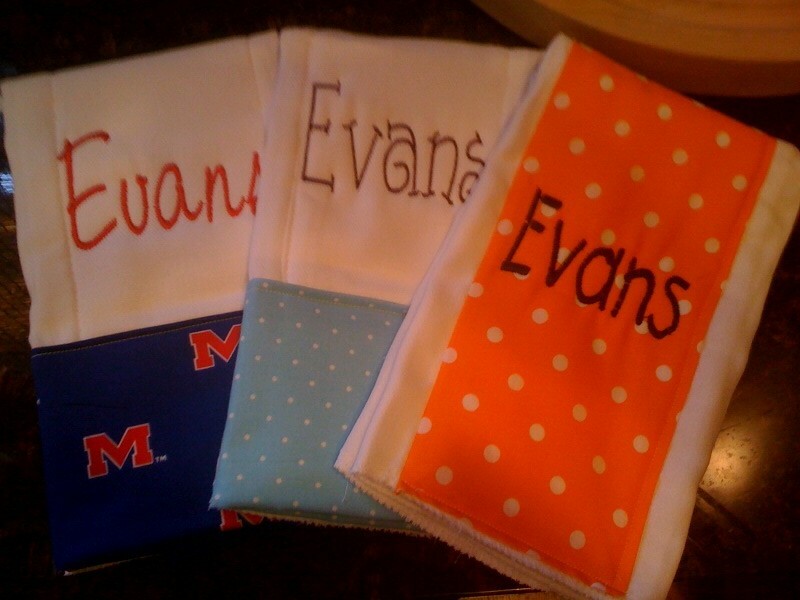 I just think that these are so cute and would make the BEST gift if anyone ever needs baby gifts! 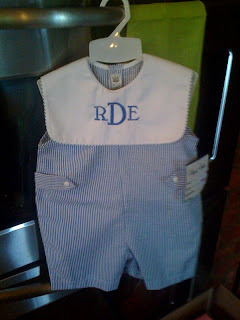 Also Emory monogrammed this outfit for Evans for next summer. Another box for me to look forward to in the mail! Anyways, I have to go turn off the pump at my Club and get it covered back up! Happy Monday to all!